Want to get fit? Want to learn something new? Need an interesting hobby? Why not try Capoeira? It is a Brazilian sport that combines dance, martial-art, acrobatics and music. Starting on 4th February, and running 8 consecutive Mondays, will be a new Capoeira Beginners Course. Covering the basics of this complex and amazing artform, the beginners course will serve as an introduction to Capoeira, and the Nottingham Capoeira community. Teaching everything from the martial, to the acrobatic, dance and musical sides of the sport, this course is for anyone: no previous experience of any similar types of activity are needed. You don't even have to be that fit! Capoeira is fantastic exercise, through which we will improve your fitness, flexibility, strength and tone. There are limited places on this course, so book your place with a £10 deposit before the course starts. To sign up to the course, click HERE to complete a simple contact form. Scroll down for terms and conditions, Frequently Asked Questions, and for testimonials from some of our beginners, before signing up to the course. Do I have to do the course, or can I just turn up to a class? Yes, you can just turn up to a class, if you don't fancy the course. You can see our full timetable and drop-in prices by clicking HERE. However. Capoeira is fun but challenging. We always recommend doing a few classes before you make up your mind as to whether you like it or not. After just one session everyone feels a little disorientated! After a few lessons you will start to feel more confident, and be able to judge it better. This is why we recommend trying the course, which will save you a bit of money on drop-in prices, whilst having a go at all sides of this complex but rewarding sport. Do I have to pay the £10 deposit to secure my place? Can I just turn up on the day? The course has a limited number of spaces, so we recommend booking your place if you are sure you want to go. The £10 deposit will secure you a spot. This deposit is non-refundable, so please be sure you can attend before paying. Your place on the course will not be secure until you have paid the deposit. The remaining course fee is due on the first class. I can only take part in some weeks due to other commitments. Can I pay less? We cannot offer bespoke programs at this time, so if you know now you can't come to all eight weeks, then either pay our drop-in rates for one off classes, or wait and see future course dates. We run beginners course throughout the year. Just come in clothes you can move around in easily, bare-footed or with flexible trainers or plimsoles. Bare-footed is always better, although you will find you get blisters until your feet become tougher. Please don't wear just socks to class, as you will slip around too much. We reserve the right to refuse you entry in the course if you are insist on wearing unsuitable clothing we deem potentially dangerous. All our classes are at the International Community Centre (ICC), 61B Mansfield Road, Nottingham, NG1 3FN. The centre is 5 minutes walk from the centre of Nottingham, and has some parking onsite, with other street-side parking available in front and behind the building. lots of flips. Will I learn to do that? Yes, you can learn to do some flips. Remember, however, that the beginners course is just that: an introduction into how to train these kinds of moves. But the key is to be patient! You won't necessarily learn it straight away. 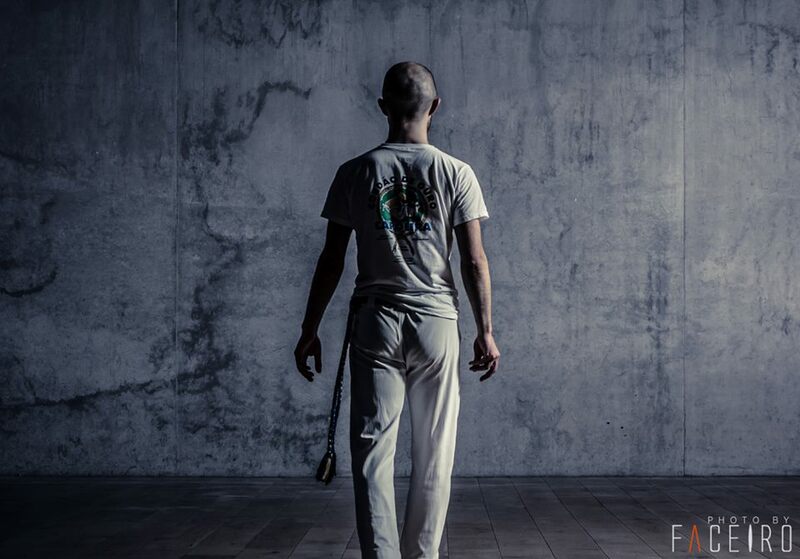 Capoeira is much more than just a sport. You may come to our class wanting to learn flips, and that is a side to it, but it has many other benefits and interesting elements too. 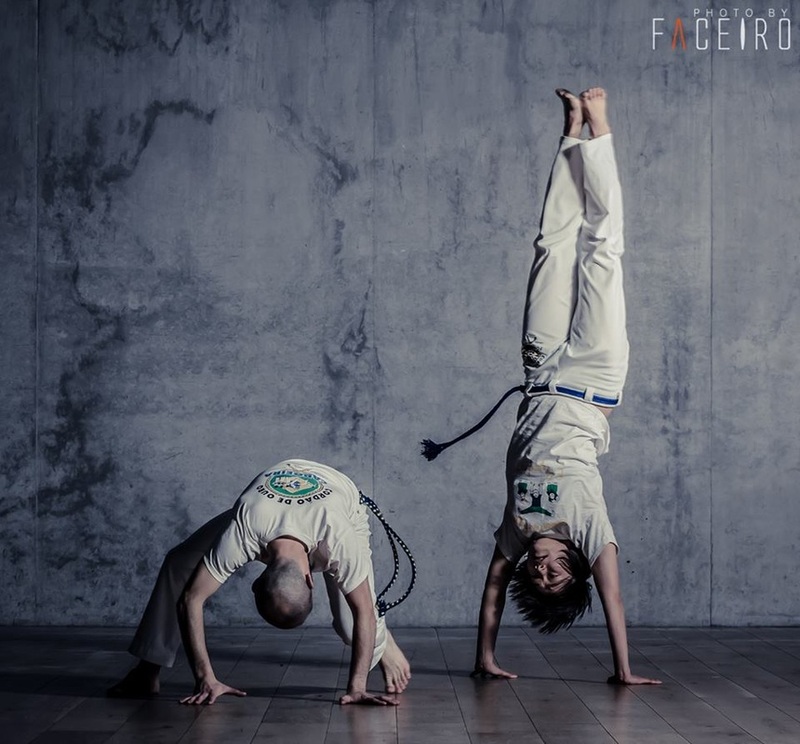 If you want to learn acrobatic movements, then yes, we can help you with these: within the overall game of Capoeira. I’m not particularly fit or sporty. Will I be able to enjoy Capoeira? We like to encourage all body types and abilities to our group, and you will always be supported in learning Capoeira on your own terms. Naturally through training you will get fitter and more confident; but the key is not to put too much pressure on yourself. That's why we recommend trying a few classes before you make your mind up. Capoeira is a lot of fun, but it also challenges each of us in different ways. If you have any specific concerns about your health, just get in touch. If I don't enjoy the course, can I get money back? No, I'm afraid we can't offer any refunds. Capoeira is a challenging, but ultimately rewarding hobby. Besides fitness, it teaches us percussion, Brazilian Portuguese, dance and martial arts. To be sure of what you are buying into, watch our group trailer, or get in touch. If during the course you are unsure about your experience, come and talk to us. We'll only be too happy to hear your feedback and doubts. Can I try Capoeira for free before I do the course? No, we don't offer free tasters of Capoeira. You can just take part in one class, but that will be payable at our drop-in rate (see our timetable HERE for times and prices). What you pay for that class cannot contribute to your course fee, if you then decide to sign up. If I can't make this course, when will the next one be? When did you start Capoeira? Benjamin: I first tried Capoeira two years ago, in Nottingham. Even though it takes me around two hours to get to class (I live in a tiny village in the countryside), I still look forward to making the trip and seeing everyone. Elizabeth: My first class was six months ago, due to a friend´s persuasion. Why did you decide to give Capoeira a go? Benjamin: I did jiu-jitsu for a number of years, but I wanted to learn a different art to broaden my experience, and I thought Capoeira might be a good complement. I had a look at Capoeira online before I went to my first class, and fell in love with the way the whole thing flowed. Can you remember your first Capoeira class? Elizabeth: It was an acrobatics class. As someone who held limited previous experience in this field, it proved rather intimidating at first; however as the class progressed I found myself rising to the challenge of attempting things I´d never tried before/never thought I would be able to do. I have been hooked ever since! Benjamin: My first Capoeira class was full of so many different elements – exercise, playing, techniques, music, socialising. There was a great atmosphere. As soon as I walked through the door, one of the teachers came to greet me and help me get my bearings, whilst other students also actively welcoming. Everyone seemed more than happy to help me as I fumbled through my first experience of Capoeira. I was paired up with one of the more advanced students, which was intimidating at first, but very helpful. What does Capoeira give you as a hobby? Benjamin: Capoeira has a unique flavour. It has something to offer to people from all walks of life, and I've met some great people through doing it. Because of this it gives me a great sense of being part of a community. One of the things that took the most getting used to, for me, was the singing. I could not believe how difficult I found it at first to do something as apparently simple as clap and sing at the same time! But I gave it a shot, and slowly started to get into it, even though I'm sure I sounded terrible. The music has since become one of my favourite parts of doing Capoeira. Elizabeth: Capoeira provides a great break from everything else that is going on – the chance to be challenged physically provides a great stress relief. I feel l am reaching a point where I am starting to understand the movements better. It has given me a better sense of physical co-ordination and strength, something that I didn´t feel would be possible before, and more confidence in trying things that I perhaps would have shied away from before. It has also introduced me to a wider network of people and culture, which is always wonderful!